A convergence of Thanksgiving and the start of Hanukkah is bringing these two holidays together at the table. This rare occurrence won’t happen again for 70,000 years (so you’d better celebrate Thanksgivukkah this year or you’ll miss out!). We’ve compiled a few festive ideas inspired by this unique celebration of two holidays on the same day. Feature a menorah as the centerpiece of your Thanksgiving dinner table alongside a display of gourds, pumpkins and flowers. 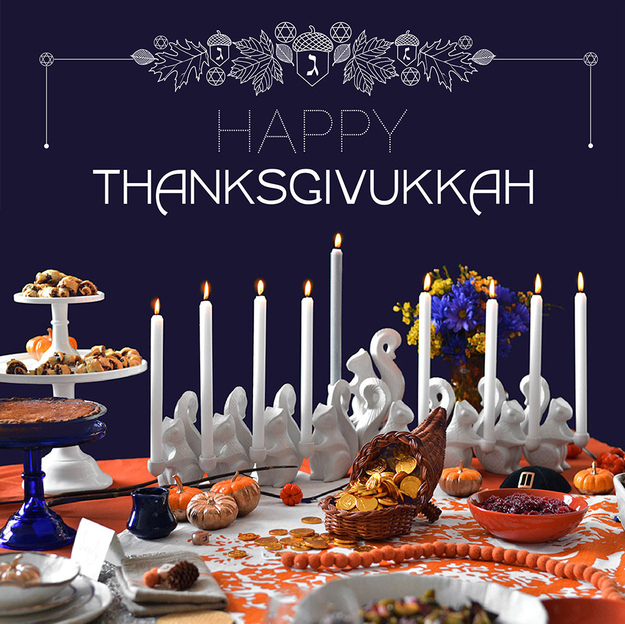 Mix traditional Hanukkuh symbols with seasonal decor as well as festive colors representing both holidays. Blues, oranges and golds will create a festive, seasonal tabletop. Nothing completes holiday entertaining in style than great food. Thanksgivukkah is inspiring an infusion of seasonal flavors in traditional foods like the Jewish Latke – a traditional Hanukkah favorite. Try a recipe for Sweet Potato-Apple Latkes or Potato Latkes with Cranberry Jam. The coming together of these two special holidays — Thanksgiving and Hanukkah –more than ever reminds us to give thanks to those who support our community. A contribution to Habitat for Humanity, your local Food Pantry, the Humane Society, or the numerous homeless shelters in our neighborhoods, remembers those in need and emphasizes the true spirit of the season.